Create a 3-D image using a bucket, a cloth, a rectangular box, a tumbler, and an earthen pot. Also show the formation of shadows due to a light source. Good. now using these guide lines draw a gas cylinder and a pepsi bottle in birds eye view and ants eye view. very good. i have sent you some basic perspective draings. please do the assignment and submit. create a 3d composition using 2 big books, a cofee mug and a computer mouse. good improvement. draw a composition using a cube, sphere, pyramid and a cylinder. use the shading techniques you have learned so far. Follow hte feedback and replicate any other 3d sketch. do it nicley and submit. replicate any 2 of the 3d compositions send to you by email. Good. lets move onto 3d composition and shading. i will send you couple of assignments by email do them and submit. create an eye catching compositions with 3 circles, 4 squares and 5 triangles. use complimentary colors to color trhe drawing. submit your assignment by 8th April 2009 evening 5 pm. Create an abstract composition using squares, leter Q and P. color them with 3 different colors and submit the drawing by 1st April evening 5 pm. your coloring skills have gone bad. compare with what you used to do in previous coloring assignments. use sketchpens to color your drawings. for theme sketching, shade using pencils. for 3d drawing - draw objects more closely and draw them big to fill in the given space. isuggest you to go through meher's and other students assignmens on this blog and reattempt the test / improve your drawings and submit them by 31st evening. Use the below ddole as a reference and recreate the scene with relevant details and good 3d shading. submit the drawing by 18th feb.
use these figures and draw a theme sketch on lake side park. submit it by 7th feb. Draw more sillhoutes. i will mail you some sillhoute, chose any 20 of them and draw a neatly as possible. submit them by 3rd feb.
Hi Chirag. good job. lets now focus on drawing human figures. i will send you a couple of images containg human sillhoutes. redraw them and give attention to the proportion of different aspects of human body. 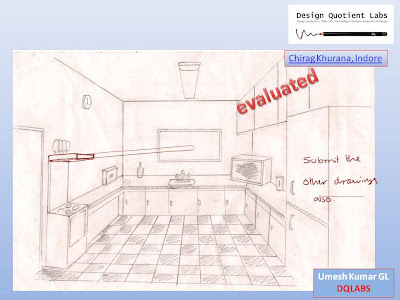 submit them by 28th jan.
Dear Chirag, use the one point perspective concepts and draw a childrens bedroom. 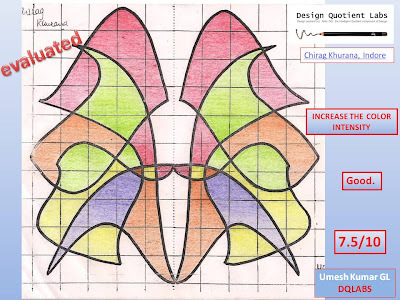 submit the drawing by 22nd jan.
hi chirag, your progress is good. Let US start with theme sketching. i shall send you some assignments through mail. submit them by 22 Dec.
you are almost getting there. i just want to see your drawings depict good freehandlines aswaell as coloring. give your best and last shot. submit your drawing by 20th dec.
Dear Chirag, you are doing good. 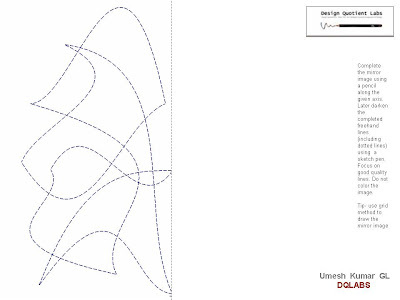 now answer mocktest 2 freehand drawing and send it to us. try to use all the skills that you have learnt so far. your sketch will be evaluated for 50 marks . if you have done it good, we will go for the next item- theme sketching. 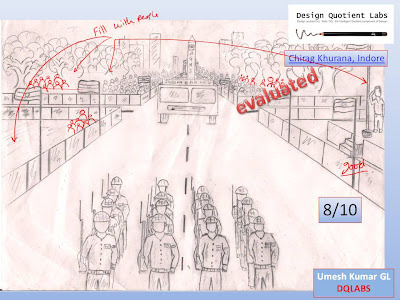 please submit the sketch by 17th dec.
Dear Chirag, this atempt is good. 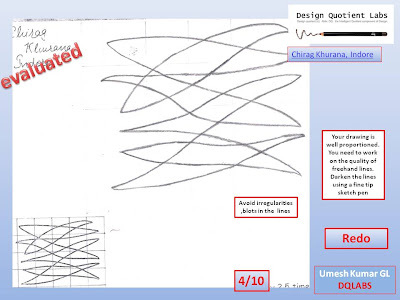 you need to draw the line quality like this every time you may encounter such assignments. now lets move onto the next part of freehand drawing- coloring. color the drawing in 3 differetn color mediums you are comfortable with and submit the drawing by 8th dec. make sure that you use 4 different colors. submit the above assignment by 5th dec.
i shall send you more practice exercises by email. please do them regulary for improving your freehand skills. draw the final lines with a sketch pen and submit the drawing by 3rd dec.
submit the drawing by 1st dec.
i have sent you some assignments on freehand drawing along with instructions. practice them daily. that should help you in improving your freehand. after doing them for 3 days, send me the best ones ( one best work per assignment) and then retry doing the above assignment one last time. a couple of suggestion for you while drawing lines using a sketch pen. 1. become comfortable using the sketchpen b do extensive practice with given freehand excercises. 2. learn to move the sketch pen swiftly along the inteded line to create a firm, free flowing tight freehand curves.3. 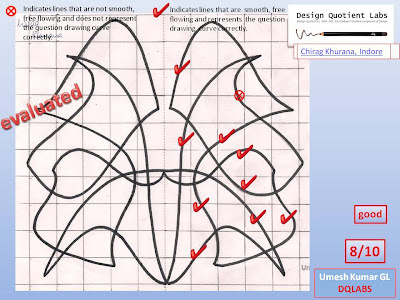 while darkening the lines using sketch pen always refer the flow of corresponding lines in question figure, and try to get a feel of the curve and replicate same on the pencil lines you have drawn before. 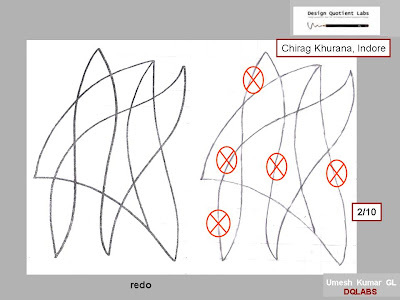 submit your drawings by 23rd nov.
Chirag, redo the assignment. 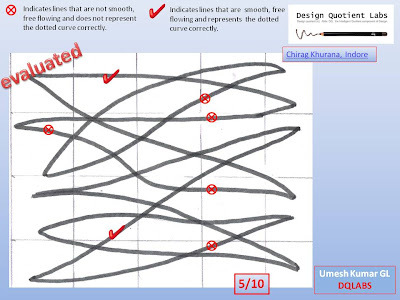 focus on quality of line. good improvement. i feel you can do a lot better. just give one last aattempt. try to get good smmoth lines. the proportion of the drawing is good. you need to focus on quality of lines. 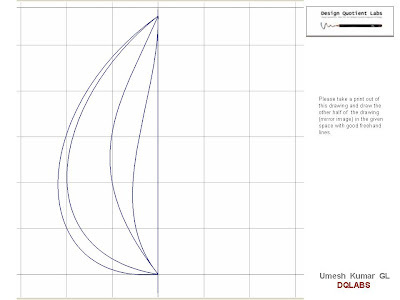 go through the assignments of akriti or vidhya to get an idea of quality of lines. submit your drawing by 12th Nov.
good attempt. the proportion of the drawing is good. however the freehand line quality is very bad. the line should be of uniform thickness and tone. please redo and submit the same. lets start focusing in improving your freehand drawing. please read through the freehand drawing chapter and also go through the students works, essentially vidhya raghavan. then attempt one assignment from the book and submit it . dont color the drawing. focus on freehand drawing quality. submit the drawing by 26th october. I have submitted my first assignment(drawing section of mock test 1) but i have not received any feedback yet.sir when can i expect it? please resend your sketches to the above mentioned email id. i m sending my sketch.sir i attempted this assignment 5 times but still i m not satisfied by myself.i m facing problem in usage of sketch pen.plz tell me how to overcome this problem. sir i m really sorry,i can not submit drawing by today(23) bcz i was out of station.i will submit my sketches as soon as possible. i met with an accident today evening and my right hand is injured.i can not move it freely and i can not make sketches or write anything.i will send sketches as soon as possible.plz excuse me. oh Boy, please take good care of yourself. get well soon.mean while go through the online classroom, essentially the mental ability part. sir i submitted my drawing on 6 dec but still i have not received any feedback.when can i expect it? take your time. erase the grid thoroughly before coloring. sir, i m really sorry,i read ur comment after coloring the drawings. & what is my next assignment? your next assignment is to experiment color gradation effect with pencils in freehand drawing, as mentioned in on of the feedback jpeg given yesterday. assignment is in DOCX format ie it can be open in ms word 2007 and i have ms word 2003.so kindly send the assignment in DOC format so that i can run it in ms word 2003.
i have resend the file now again. please check. i m really very sorry bcz i submitted this sketch very late as i m having my pre board exam from 2nd jan.
can i submit other sketch after my exams ie 23rd jan? i have pre-board practical examination on 21 & 22 jan.may i submit other 2 drawings by 23 or 24th jan? ok. do your exams well. I submitted my sketches day before yesterday,but i have not received any feedback yet.sir when can i expect it? CAN I CONTINUE AFTER MY EXAMS? my board exams are over and i heard nata cource has been changed so will u give me new assingement or should i complete my previous assingnment? i submitted my sketch 2 days ago and still i have not recieved any feedback.so when can i expect it? I have mistaken your sketch with rohits and have posted it in his blog. please write your name on hte drawing so that such errors do not happen. i have recieved my feedback but i hane'nt recieved any assignment through email.plz mail it asap. i have sent you email containng images, yesterday and today(twice).please check your inbox aswell as junk mail. if you havnt received them send a mail to sketch evaluation email id. please check your gmail and confirm. now i have recieved my assignment. 1 is there any -ve marking in online part? 2 what kind of question will be asked in mathematics part,i mean to say 11th and 12th level maths or 10th level,bcz maths que asked in aptitude test of aieee were of 11th and 12th. 3 in 2d composition i faced lot of prob like using sketch pen is time consuming for me,skecth pen set which i used today were used only once and they dried up during the exam. so is there any other altetrnative. 4 que in aptitude test will be asked from 3 booklets that u have provided me? 5 what should be division of time for 3 drawing que? NATA is an adaptive test, if you are answering the questions well, you will be given tougher questions. if you are not doing the the test well, you will be given easy questions to determine your aptitude. later depending on the type of questions and number of questions you have answered an weighted average score is given. simple mathematics. refer the kind of questions in mocktest and questions banks. explore other coloring mediums. pencils / water colors , if you are comfortable with them. Yes. also go through the online question bank and mocktests. i wish to take up architecture after my 12th. Im presently in my 11th. i would like to know how i can develop my sketching skills and how can i take up the long term sketching course? have u received my assignment? its 3 days since i mailed my theme sketching assignment but still i havent received any feedback.plz see to it. what is my next assignment? should i redo that prev theme sketching assignment?